Books are approx 9x12 , 71pp, 35 duotone plates, hardcover in soft cloth, published w/o slipcover, signed by Craig Morey. Prints are 8.5x11 black & white. Signed and numbered archival fiber exhibition prints from digital negatives. These are original first editions of my 1992 monograph Studio Nudes. If no choice is made, the default is a simple signature and date. Please note: as first editions, these books are all 20 yrs old but in decent condition (bookseller category "like new", "very good", or "good") There may be some slight cosmetic signs of wear or shelf storage, minor markings, and a few have interior pencil marks from book stores, etc. The prints are brand new, printed within days of ordering. I post new print auctions or sales each week. Note to UK, Asian and European buyers. I apologize for this inconvenience; however you may still be able to learn about new print offerings by signing up for my newsletter. Craig Morey is an award winning photographer, based in the San Francisco Bay Area for over 25 years. He is well known for his black and white studio nudes, and has published five monographs of this work, including Studio Nudes (Penthouse, 1992), Linea (Korinsha Japan, 1996), and 20th Century Studio Nudes (Glaspalast, Germany, 2001). His photographs are included in hundreds of books, magazines, and art photo web sites. Morey is also available for private commissions, workshops and tutorials in his California studio or on location. 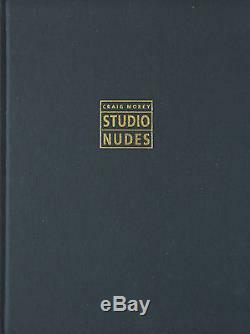 The item "Studio Nudes 1989-1992 B&W Art Photo Book + Signed Print by Craig Morey" is in sale since Tuesday, March 12, 2013. This item is in the category "Books\Nonfiction". The seller is "moreystudio" and is located in Emeryville, California. This item can be shipped worldwide.